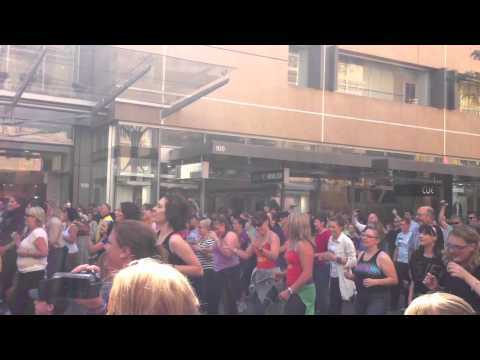 It is a little over two years since I started the Adelaide Flash Mob (AFM). I’ve had some help from a number of people for various events but most I have organised by myself. I am now ready to hand over the organisation to others for a while so I decided to write this article to give them a headstart. Other people who are looking to set up a group and run events will also find it useful. The AFM started out on Facebook and I still think its by far the best tool for organising events, especially those of this nature. All you need to do to get started is set up a flashmob group on facebook and start promoting it. Invite all your friends and encourage them to invite theirs and so on. You can also post a link to your group on other local facebook groups and non facebook websites such as message boards. Once you have enough people in the group you can create a facebook event for your first flashmob. In addition to Facebook, we’ve used a number of other mediums to promote our events and stay in contact with members. Most of these are optional, but I would suggest that a website is a very good idea for to cover and promote your group’s activities. The official Wikipedia flashmob definition above has proved to be a useful foundation for the AFM’s bread and butter events. However, I saw no reason why we should restrict our activities to those defined above. Inspired by groups such as Improv Everywhere, we’ve successfully branched out to other types of events such as Ninjas, No Pants and Burst into Song. Different people organise and participate in flash mobs for different reasons. For me, flashmobbing has always been about having fun and creating unsuspectators (unsuspecting spectators) of passersby and hopefully giving them a story to tell. I also like creating videos, reports and discussions of our events so that people can stumble upon them and be like WTF and have a bit of a laugh. If someone wants to organise an event that doesn’t necessarily conform with the wikipedia flashmob definition but still has the same goals in mind then I say have at it. We quickly realised that people were only penciling in our events on their calenders rather than making a strong committment. The theory was that single mob events weren’t really worth the time and energy to get to the location and plans to attend were quickly abbandoned for any alternative. To combat this we started running flash mob events with 3-4 mob activities each event to make more of a day of it. This seemed to work quite well and we haven’t looked back since. From time to time I gets emails from people or groups wanting to do a cooperative event for a charitable, religous, political or commercial cause. These are instances where the goals of the events are not in line with the “fun” goals described above, therefore I decline. My response has always been that the AFM doesn’t support any position on any side of any issue. I’m happy to offer them advice about planning and runnings flashmob-like events and even letting our members know that the event is occurring but nothing more. Here I will explain the basic process we use to organise AFM events. This needs to be the first step as it will inform the date and location decisions that follow. You don’t need to work out the specifics yet, just the basic shell of the idea or type of idea. It pays to do a bit of research for this. Send out a message to the group and try and get an idea of what days, dates and times people are free and which locations they can easily get to. Some ideas might require specific types of destinations so keep that in mind also. We have been stung a few times with low turnouts because we scheduled our event the same day as some other major event. It helps to put the definition of a flashmob along with some links to past event reports or videos to let people know what flashmobbing is all about. It also helps to encourage people to invite their friends along as well to try and get the event going viral. If you use media other than facebook, eg. a website or mailing list, then you should post the event details to those mediums as well. For most of our flashmob events we didn’t give any details on the event page, only instructed them to meet us at a particular time and place to receive a sheet of written instructions. We found that this meant our events were more secretive and passersby were less likely to know what was going on. Regular participants also commented that it added a secret agent type feel to events, which they enjoyed. This approach limited our turnouts significantly to 15-30 participants with many people saying that they weren’t prepared to make the committment to come out unless they new what was happening before hand. For our past few events we have experimented with putting the instructions on the event page well before the event. We needed to ensure that the ideas were quite simple so that people could easily understand and remember them without any explanation. This approach led to our last event having around 100 participants which we were very happy with. If you decide to go with the second option (posting the instructions on the event), a method we’ve had success with is to create the event with the instructions for the first activity on the event then add the rest of the instructions in the follow up to the day. Each time you add more details you can message all the invitees to let them know, encourage them to invite their friends and drum up some anticipation and excitement about the event. Frequent messages leading up to the event is also a good way to remind people that the event is on so they don’t go and make plans to do something else that day. We have been lucky enough to have a fairly dedicated videographer right from the start. If you don’t know anyone, send out a message to the group to try and find someone. If you can’t organise filmers then photographers are the next best thing. Depending on the event, there might be various levels of organisation required on the day. We have found it beneficial to include something on the event page to let everyone know they can come and have some lunch/dinner at the foodcourt after the event if they want to. I like to go around and introduce myself to the participants, ask if they enjoyed it, which activity was the best and and suggestions or ideas for future events. We do this on our website but if you don’t have a website you can always create a discussion on the facebook group. Post links to videos, photos and write a report on how they event went. Message all the event invitees, thank them for coming and encourage them to head to the event report and post their comments on how the event went. You need to do this as soon as possible after the event while it’s still fresh in everyone’s minds. Event reports are one of my favourite parts of flashmobbing after the events themselves. They provide a lasting record of what happened on the day and are great for promoting the group and helping to get people excited about future events. One thing I’ve noticed is that people can get pretty excited about flashmobbing in the lead up to events and shortly after, but if they don’t hear from you for a while they quickly lose interest. In order to maintain interest and keep people motivated its a good idea to stay in contact with group members inbetween events. Create some discussion threads on the group page and encourage people to discuss possible ideas, post links to similar events from around the world and get involved in the organisation proccess. Whether you have one, two or ten organisers, each event needs an Event Champion (EC) to make sure things get done. In my limited experience organising events with a small group of people, unless you have a strong voice to lead the group and make the important decisions on time, nothing seems to get done. Whats more, the internet medium makes it much easier for people to ignore requests for help, hiding behind the excuse of ‘I haven’t had time to check my messages’ or something similar. For most of our events since the beginning I have been the sole organiser and hence the Event Champion in each case. However, the EC model should work with any number of organisers. The idea is that the EC still coordinates the organisation and makes the important decisions but delegates certain tasks and draws on the input and expertise of other organisers. Below is a list of the key organisational roles for putting together a flashmob. The AFM organisers use a seperate facebook group to discuss and plan upcoming events. The members are encouraged to volunteer for a role and advise of any other special skills the possess. The chosen role and special skills are then attached to the person’s name using the ‘officer’ function in the group. This should be a small, motivated and trustworthy group of individuals who will maintain the facebook group. They should have admin privelages of the group/s. The ECs organise and run the events. Anyone can be and EC. If someone has an idea for an event, they need to contact an organiser to work out a date and create a facebook event. Once the event is created, the organiser simply appoints the EC to be an Admin of the event. The EC is responsible for ensuring that each step of the organising process gets done. They may divide and delegate tasks as they see fit, but in the long run they need to make the hard decisions, on time, to ensure that the event runs smoothly. If you send out a message to the facebook group you will probably find numberous budding Youtubers willing to film your events and edit the footage. We are lucky to have a dedicated videographer who films each of our events, edits the footage and uploads the video to the Youtube channel for everyone to enjoy. The website editor is responsible for maintaining and updating the content of the website. Anyone can come up with event ideas. Ideas need not conform with any particular structure but should have similar goals in mind. Responsible for dealing with the media whether its contacting them for event promotion or responding to requests for information and interviews. In general this means promoting the group to get more regular participants. This is one aspect that we’ve dabbled in at the AFM but is an area where much more could be done. Theres a bit of a catch 22 because more people means bigger and better events so its desirable, but if the group and events become too well known then the flashmobs will lose their impact on unsuspectators. Below are some methods we use to promote the AFM. If you have any other ideas please post them in the comments below. Adelaide only has a population of about 1.2 million so to avoid over exposure, our strategy has been to promote the group in every way we can and to promote our non flashmob events such as Ninja’s and No Pants, but not to promote the individual flashmob events themselves. We contact the media specifically to promote large, open events such as No Pants. If we have requests for information or interviews from the media then we accept and use them to promote the group in general. We try to keep the details of upcoming flashmobs underwraps and direct people to the facebook group or website if they want to get involved. Keep in constant contact with the group. Message everyone each time something happens such as a video going up or event report coming out. If nothing has happened lately, send a message asking for event ideas or expressions of interest to help out with organising. Encourage people to invite their friends at the bottom of the group info, event info and in relevant messages. Contact the admins of related groups and ask if they can send out a message to their members of post a link in the news about your group or upcoming event. Don’t spam though. Send out regular messages to event invitees leading up to the date so as to keep people interested and remind them that the event is occurring. Publicise videos by facebook, email, website etc. If you use instructions for an event be sure to put your website and facebook group address down the bottom. Try and get the group and events mentioned on forums, blogs, events websites etc.